These scones are a recipe I make quite often. I even bring the recipe with me when we travel to see friends or family and make them as a treat to say thanks for having us. 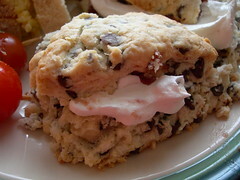 This is a mixture of several scone recipes that I liked for various reasons. Combine dry ingredients. Rub butter into flour until mixture resembles coarse cornmeal. Stir in chocolate chips. Pour in cream and mix just until combined (DO NOT OVERMIX). Roll out to ¾” thick and cut with 2” biscuit cutters, or form into round and cut into wedges. Bake at 450 F for 15 minutes. Even better with a cinnamon sugar glaze! And as in the picture, best with jam and whipped (or clotted) cream. My mother sent me a large bag of Oregon hazelnuts after I dropped a few not-too-subtle hints before Thanksgiving, because to me, "chopped nuts" or "ground nuts" in Christmas cookies simply have to be hazelnuts, because that is what we used throughout my childhood. Of course, growing up in Oregon, we called them filberts. But that is a subject for another day. In one of my favorite baking blogs that I read (Cream Puffs in Venice, I came across this recipe. She followed the recipe exactly until the very end, where she rolled the edges in chopped hazelnuts. I abandoned the recipe when it wanted me to chill the dough two separate times. Instead I did the first chill and then scooped out equal amounts of dough, pressed the cookies down with a fork, and baked them a little extra. The result was a more rustic feel than the original recipe, more suited for a glass of milk than a shot of espresso. The taste was amazing, and the raspberry jam sandwiched in between seemed just perfect. Next time I'd like to use Nutella, because I'm sure that would only enhance the hazelnut flavor, but really, it came through on its own. Using the other half of the danish pastry dough from Baking with Julia, I made danish pinwheels, turnovers, and wraps. 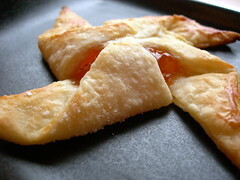 (Pinwheels with apricot jam pictured). I used the rest of the confectioner's cream in the turnovers, along with raspberry jam. I experimented and tried lemon curd in some of the pinwheels, and although it tasted good, the amount of sugar and lack of pectin meant it melted all over the parchment paper. 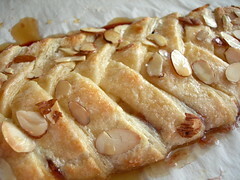 Of everything I tried, I definitely prefer the taste of the long danish braid rather than individual pieces. This was my first foray into breakfast pastries!! I have been wanting to attempt something like this for over a year but every time I would wake up one morning and think "pastries would be nice today" it would already be too late. But this time I thought ahead. 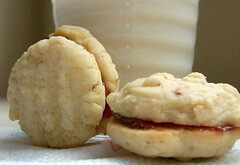 The recipe I used comes from Baking with Julia, and I feel as if it is too complicated and long to replicate here. But please, go and buy the book or check it out of the library. 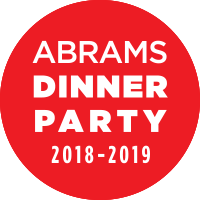 (I also like it because some of the recipes are written just like she is talking to you, with sentences like "If you're feeling brave...."
The recipe uses the danish pastry dough at the front of the book, which is used in several different recipes. The dough has butter that the baker is instructed to leave in big chunks, and you can see it throughout the process. It has to be mixed, then chilled, then rolled out in several stages, including folding the dough like an envelope in between rollings. This danish braid used half of one recipe of the pastry dough, and also includes a confectioner's cream (using the microwave, which is much quicker than what I've done before in a mixer) and fruit jam. I used fruit-only raspberry jam instead of making one from scratch, and it worked out great. After the pastry was braided, it was left to get a little puffy. After it came out of the oven, I glazed it with a coffee glaze. This was delicious and definitely worth the work. I still have half the dough to use, and next time I'll just make the dough sometime during the week and have it ready to use on a weekend morning. 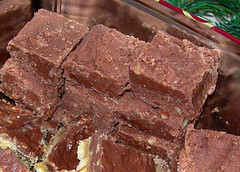 This is my Grandma's fudge recipe that she got from her Grandma. The holidays are simply not complete without it! Boil the above together for 5-8 minutes at medium heat, stirring constantly, until the mixture has thickened and is pulling away from the edges of the pan. (The original recipe says 8 minutes, I find 6 to be better on my stove). Pour into a buttered jelly roll pan. Cut when cool and store in airtight containers. To make things easier, my Grandma puts the chocolates in a bowl and the marshmallow cream on top, so the candy mixture does not overcook while you try to scrape the marshmallow cream out of the jar. Another hint is to use chopped nuts but not ground - ground will dry out your fudge (which is an issue in this particular picture).